But, do anyone know the codenames of these 2 NOSS missions ? And do you know other missions I could have missed ? Those are "codenames" Just names of launches. Yeah, I imagine the best way to determine the specifics on an NRO satellite would be launch mass compared to prior launches and characterization of the orbit...Molniya type, geosynchronous, sun-synchronous, etc. Might be a little harder with something entirely new, but certain missions have certain optimal orbits. You've missed out L-22 (SDS), which I believe was "Prowler". EDIT: Sorry, that was a Delta IV launch. I think that the designation still applies though. Who can add the list? NROL-25, planned late August 2008, Delta IV Medium from VAFB. NROL-26, planned NET April 2008, Delta IV Heavy from CCAFS. NROL-28, planned February 26 2008, Atlas V 411 from CCAFS. "Now you may leave here for four days in space, but when you return it's the same old place..."
I think L-26 is scheduled for 15 May 2008 (range conflict permitting), I believe L-29 may have been cancelled. The existance of L-15 is also debatable. Further ahead, I think that L-32 is scheduled for Q3 2009, L-34 for October 2009 and L-41 for June 2010. L-39 and L-45 can also be added to the list, from VAFB. Launch dates for those vehicles are far enough out that they're not worth mention. NROL-10 USA-155 on 06.12.2000 was launched by Atlas 2AS AC-157 not Titan 4B-30. oops... It's my mistake, you are right. It is interesting, thanks WHAP! Does anyone know the NROL 28 launch name ? Thanks. There does not appear to be a mission name for this launch. The PLF logo was pretty bland, and even the patch that showed up on eBay didn't have one. I'm not quite sure whether NRO L-6 is USA-139 (Advanced Orion), launched on 9 May 1998, or Mercury-3, which was lost in a launch failure on 12 August 1998. L-27 (DIVM+(4,2), April 2010) is probably Trumpet, L-15 (DIVH, April 2011) and L-32 (December 2009) could be GSO ELINTs. L-49 (DIVH, December 2010) is probably the last Improved Crystal, but it could be Lacrosse. L-29 (Atlas, TBD) is probably radar reconnaissance, hit by huge delays following the failure of L-21, which would explain the dissapearence from the schedules. The same could apply for L-39 (Atlas, 2011). Not sure about L-34 (AV401, October 2009), but possibly NOSS. I really don't know about L-41 (AV501, 2010), probably something with high volume and low mass. I would guess a follow-up to either Lacrosse (Like L-29) or Improved Crystal. These are just guesses, and time will show how many are correct. L-6 appears to have been the Mercury. The launch name was "Elwood". The launch name for th Advanced Orion on 9 May 1998 was "Jack", and the launch name for the SDS on 3 July 1996 was "Cygnus". I think L-14 might have been the Improved Crystal on 5 October 2001. 1- I read somewhere that Prowler is the followon of Trumpet. otherwise it will be a Prowler, if the launch will be to a Molniya type orbit. 2- I suppose that the already launched NROL-22 and NROL-28, were Trumpet/Prowler type. NROL-13 and NRO-18 from VAFB and more recently NROL-23 and NROL-30 from CCAFS. Apparently, this type of sats, will now return to be launched from VAFB. I have read different things about Prowler from different places. Some sources say that it is a Molniya-orbit ELINT (L-22 and L-28), whilst others say that it is a GSO ELINT bird. According to a source, ULA have publicly acknowledged that L-26 is a GSO launch. I would expect that as with Titan/Centaur launches, the payload will separate into GSO and not GTO. They would appear to be Trumpet, or a follow-on programme. If Prowler is the Molniya-orbit programme, then this would apply. It would appear so. Interesting to note that the next Trumpet launch appears to have switched the other way. Having seen the mission patch, I am absolutely convinced about L-25, as it exhibits a symbol which has appeared on several NOSS patches, and nothing else. It is probably to early to say about L-34. Interestingly, I've been studying the PDF document linked to earlier in this thread, and it appears that one of the big payloads in the next few years is too heavy for D-IVH. That would suggest that they're not all the same type. Owing to its out-of-sequence designation, I am guessing that L-15 is the odd one out. Possibly an old LEO recon bird making one last flight. Some sources suggest that a sixth Lacrosse was built, and there is strong evidence that another Improved Crystal is on the way (one was supposedly ordered sometime around 2005/06 due to delays with FIA). The strange thing is that DIVH can supposedly outperform Titan. IC cannot launch from Canaveral, hence it is probably L-47, but Lacrosse has done so twice. Therefore if L-15 is an old LEO bird, it must be Lacrosse. The only other possibility would have been Misty, but that has been cancelled. The only confusion over the Lacrosse is that it would presumably be a replacement for Lacrosse-2, which is in a higher inclination orbit that can normally be reached from Canaveral - maybe the preformance issue is to do with a dog-leg in order to reach that orbit. Thanks very much for reply. As usually for the military programs, when the launches will take place, we will know more about them. Only five launches already performed remain to be determined. Pratically I suppose that the NROL codenumbers started on 01.10.1996 with the Fiscal Year 1997. USA-125 (SDS) - Titan IVA - 3 July 1996 is also possible. I don't know if they designate small satellites (but there again they don't normally get USA designations either). It is very likely to be STEX if your theory about the introduction is correct. Ignore the NOSS launch in my last post, that was a mistake. The really strange thing is that the L-2 payload patch says "Titan-Centaur" and "SLC-40" on it, but was launched with out a Centaur and from SLC-4E. I noticed the same anomaly on another Improved Crystal patch. I'm looking into it. If the patch is to be believed, the launch name was "Joker", but I cannot be sure due to the inconsistencies. The patch looks a bit like a Milstar one, so I'm wondering if the payload was transferred or something. Can you post a picture of the patch? Here they are. The "Joker" patch is L-2, and the "Sugar Daddy" patch is the previous Improved Crystal launch, which was on 5 December 1995. Both claim to be Titan-Centaur launches, but both serial numbers refer to Titan-only launches. The images were downloaded from ebay, but are in the public domain under US copyright law, as they are images of work produced by the US Government, so there should be no legal issues. 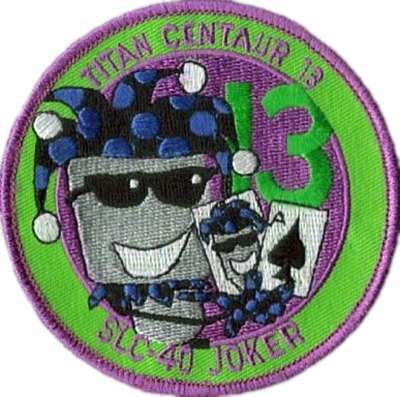 The Joker patch is for Titan/Centaur-13 (Titan 4 A21/K21), which was a Milstar launch on 11/6/95. It is not NROL-2. 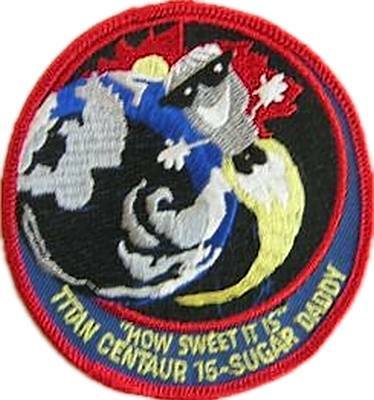 The Sugar Daddy patch is for Titan/Centaur-16 (Titan 4 A17/K20). This was not a Milstar launch. It occurred on 11/7/97. What's with the difference in designations? Are you sure? I've already seen two patches for that launch. 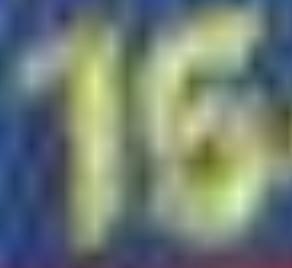 I would say the number looks more like a 15, not a 16, but it is hard to read given the low quality of the image. If it's T/C-15, it was on Titan 4 A16/K16, also not a Milstar mission. I forgot what the Titan "K" designators represented; the A represents the Titan 4 model (the B model had upgraded SRM's and avionics, I think). Looks like I was wrong about L-6. L-6 was USA-139, L-11 was USA-152. I'm not sure which designation applies to Mercury-3. I'm pretty sure we called that one "Sweet 16" as in a young girl's 16th birthday - hence the "How Sweet it is" and the "Sugar Daddy" references. I didn't work that mission (since it flew with the older Centaur avionics?) so I didn't get the patch. Yes "Sweet 16" is on the launch patch. Seems to make sense. I now have three patches associated with that one, did they give the Centaurs their own patches on some flights? Most, if not all, of the Centaurs had their own patch. I had to go through my stack of T-shirts (I got those in lieu of the patches; the T-shirts are not specifically for the Centaur) and confirmed that this one was TC-15. It has the Sweet 16 reference, which must be for the Titan booster (Centaur was Sugar Daddy, as shown on the patch). Both TC-15 and TC-16 flew with the newer avionics. USA-133 Lacrosse 24.10.1997 Titan IVA was NROL-3. I agree that it is probable, but it is not definite. These things do move around - look at L-1. http://www.webcitation.org/5imPuwg3q (I've archived the URL as ebay don't keep pages for too long). Much more interesting than some of the recent ones in terms of "clues" to the payload. A bird (presumably a phoenix) is rising out of a fire at the bottom of the patch. Fourteen stars are clearly visible, ten on a US flag in the background, and four at the bottom of the patch. What I believe is a fifteenth star is partially obscured by the bird's wing. In addition, one of the stars on the US flag appears to be in the bird's beak. The words "melior diabolus quem scies" appear at the top of the patch, which roughly translate as "better the devil you know". My own assessment of this would be that the phoenix symbolises the NRO's optical reconnaissance programme "rising out of the ashes" of FIA. As I stated previously, it was reported that Improved Crystal production was restarted when FIA was cancelled, and I had previously suspected that L-49 might be an Improved Crystal. The latin phrase seems to support this theory. Also, if this is an Improved Crystal, it would be the fifteenth launch of a KH-11 series satellite (including the ones sometimes identified as KH-12, and excluding both Misty satellites). One of the earlier KH-11 launches failed, so the fifteen stars could represent the fifteen launches, with the obscured one representing the failure. The star that appears to be in the bird's beak could represent NRO L-49, being "carried" to orbit (I'm fairly sure that symbolism has been used before). Finally, the shape of the phoenix's wings is similar to the shape of a symbol which appeared on the NRO L-14 patch, which is believed to have been an Improved Crystal launch. It was only the day before yesterday so I don't think my memory has gone yet - it didn't look much like CCAFS to me. That was a typo, and has been corrected. Sorry if I'm asking in the wrong place. Do we have a thread of NRO L-66 launch? Can't seem to find it here or in the Orbital board. Cheers. NROL-25 has a 5m fairing, but earlier NOSS launches on Atlas fitted pretty well inside the 4m fairing. Therfore i think, a FIA-R is more likely. NROL-34 is AFAIK a Atlas V 401. It could well be an SDS on a molniya orbit, a Trumpet F/O or a NOSS payload. L-34 is definitely going on a 411, I've got an image of the launch patch somewhere, I'll try and find it. Although NOSS can fit inside the four metre Atlas fairing, it did require a lengthened version. The four metre Delta fairing is far shorter, and I do not believe a NOSS payload would fit inside. The five metre fairing is longer, and should be sufficient. There is also a typical NOSS symbol on the patch, but that could be wrong. I agree that if it is not NOSS, then it will be FIA-R.
Also, I've seen a suggestion that USA-144 might have been NROL-9. I've found the patch - you are right, it is an Atlas V 411, which makes a Trumpet F/O likley. From the PPGs, the Delta IV 4m fairing is 11.7 metres long, Atlas EPF is 12.9 metres long, Atlas LPF is 12.0 metres long, and XEPF is 13.8 metres long. The Delta 5m fairing is 14.3 metres long. For that matter, I'm not convinced that Delta IV can carry FIA. Its fairing only has slightly more usable volume than the small Atlas V 5m fairing, and the Atlas V required the medium fairing. Unless the size difference between the spacecraft and smaller fairing is marginal, I doubt if it would fit. If L-39 and L-41 are both FIA-R then why was L-41 the first? The launch numbers are not chronological. For example NROL-1 was an SDS launched much later than several other SDS payloads. L-39 was first scheduled to launch before L-41 according to the manifest on page 6 of this pdf. It seems likely that L-9 was USA-144, so L-8 was probably STEX. Some more details on upcoming missions. I don't have a clue what L-35 and L-67 are. Best guess is something new. L-67 could be a geosynchronous ELINT satellite to begin replacing the Mentors, but given the other DIVH launches from the Cape, Mentor launches are likely to continue for some time. That said, it could be some time away. L-35 is even more of a mystery - why would anything need an Atlas V with three boosters from Vandenberg. Every known class of NRO payload will either fit on an Atlas with at most one booster, or it won't fit at all. My best guess would be a prototype optical satellite, but I thought KH-11 production had been restarted. Of the others, L-65 will be either KH-11 or Mentor depending on launch site, L-55 will probably be NOSS or SDS (my money would be on NOSS, the type used to launch from Vandenberg on the Atlas IIAS). L-36 looks like another Trumpet. * - The NROL-34 mission patch calls the rocket "Frigga", however mission posters call it "Odin"
According to http://www.defenseindustrydaily.com/Despite-Problems-SBIRS-High-Moves-Ahead-With-3rd-Satellite-Award-05467/ a third SBIRS-HEO spacecraft is being prepared for launch. The last two were attached to Trumpet satellites, so it seems logical that it may be on NROL-34. NROL-37 - - Mentor? - 2015 - Delta IV-H - CCAFS? "The NROL-34 mission patch calls the rocket "Frigga", however mission posters call it "Odin""
Launch vehicle names are different than mission names. If it is on a SLS patch, it is a booste namer. Mission names are on the fairing. Frigga, Gladys, Betty, homer, Elwood, jack, Oscar were booster names. does anyone know where to get the FRIGGA insignia as a graphic version? I recently obtained a launch patch for NROL-25. It has the name "electra" for the booster name. According to a budget report, the US Air Force is expecting to take delivery of SBIRS-HEO 3 in August. Not sure what to make of that - the gap between delivery and launch was about two years for the last two SBIRS-HEO payloads, but both launches had been severely delayed. I would expect that HEO-3 will be mounted on an Improved Trumpet satellite like the last two, so it would probably be on an Atlas V 411 or Delta IV-M+(4,2) from VAFB. I had identified L-38 as the probable candidate, but given that it is scheduled for launch in August, it seems less likely. From my analysis of past Jumpseat/Trumpet launches, I would be surprised to see two launches in the next two years, so unless delivery, integration and launch can be conducted in the space of a month, NROL-38 is likely to be NOSS. SBIRS-HEO 4 isn't due to be delivered until January 2015, so we could be looking at the current Trumpet satellites being replaced after about 9-10 years in orbit (the first was launched in 2006). Looking for some information on NROL-55, I stumbled upon an old post at Novosti Kosmonavtiki. It quotes a no-longer-accessible NASA document on EELV operations, and gives the launch sites and scheduled dates for a number of scheduled launches, circa 2005. There's a figure on page 5 of the thread which appears to have been taken from the document. NROL-25 was slated to fly on a Delta IVM. That suggests that it has a very low mass, and that its expected size must have increased to justify the change to the M+(5,2) - with the IVM apparently out of service, the M+(4,2) seems to be launching the other payloads which were slated for it. NROL-30 was listed as being on an Atlas V 501, rather than the 401 which actually launched it. Not sure what to make of this, and it could be an error in the document (the figure lists it as an Atlas but uses the Delta IV symbol instead of the Atlas one, so other errors may have crept in). If it was actually expected to use a 501, then it would be interesting, because it has until now been assumed that the payload was a third-generation NOSS; several of which had been launched by earlier Atlas models, so the fairing requirements would have been well known. The implication would be that this could be the first fourth-generation satellite. NROL-34 appears to have been moved from Canaveral to Vandenberg, presumably to relieve manifest congestion. Not a huge surprise, and we already knew that NOSS could launch from either coast. NROL-36 has also been moved from Canaveral to Vandenberg. In theory, SDS (Molniya) and Trumpet can probably be launched from either coast, current generation satellites have thus far launched exclusively from the East and West coasts respectively. That gives a very weak indication that it might be a NOSS. Interestingly, the thread also contained a link to a copy of a USAF press release which effectively stated that NROL-25 could not be launched using an Atlas V. It's a medium-class payload well within the capacity of both EELVs, and the release is dated after conversion of SLC-3E had been authorised, so that doesn't make much sense. At the time, NROL-25 was expected to launch in 2005, so I can only think they wanted to make sure that it didn't have to wait for pad conversion work (which itself doesn't make sense, given the fact it was later delayed five years in order to make sure NROL-49 launched on time), and since all indications are that NROL-25 is NOSS, it could probably have launched on an Atlas from Canaveral anyway. With regards to the NROL-30 question, does anyone have any information on the fairings used by the Atlas II and III NOSS launches? Also,the DIVM is still available. Thanks - no discernable change, so I'm going to assume the 501 was just a typo. I was curious as to whether the same fairing was used for Atlas II/III and V NOSS launches, in order to ascertain whether any change in the size of the spacecraft occurred with the change in rockets (which would have explained why L-30 was listed as a 501 not a 401 in the NASA document. Thanks for the clarification about the DIVM, I thought I had read something about standardising on the M+ around the time that the GPS launches switched to it, but I can't find it now. According to MSDB, L-65 will launch from Vandenberg next year on a DIVH. That means it is almost certainly a KH-11. I thought NROL-49 in January 2011 was supposed to be the last KH-11, built from spare parts after the collapse of FIA. But WP (FWIW) says "NRO ordered two additional legacy hardware KH-11s"? Was NROL-37 a slip in the timeline? Do you have a link to the article? Interesting that NROL-67 moved to the west coast according to the two references. Is that move real or an error with one of the sources? Very unusual to see the orbits included...not sure how accurate they will be, but assuming they are, I'd say the two 401s are probably NOSS. The others are a little odd - the only NRO payloads that launch on a 411 are NOSS and Improved Trumpet, and they don't go to GTO. I can't see an Improved Trumpet class launching on a 411 to GEO because it would have to carry a kick motor or a lot more fuel, so it would need a bigger rocket. Best guess would be a fourth-generation SDS. That leaves the two 541s. LEO from VAFB usually means IMINT. I can't see FIA-R being replaced that soon, so my guess would be a new electro-optical satellite. Rocket is a little large for that though - comparable commercial satellites are booked to launch on 401s. That said, this assumes that the orbits are accurate. Huh? Too large? Commercial satellites aren't comparable. Spacecraft on Delta IV Heavy would be. True, but I was under the impression the NRO was moving towards smaller satellites, not much larger than the commercial ones. Before its cancellation, FIA-O was believed to be slated for a 521. The document was dated May 29-30 2012, the copyright was 2011. I kept a screenshot of the table of launches. It is quite possible they got the Atlas V 541 launch wrong, also note the launch years were labelled FY2015 etc. I am not sure what the US FY is. In Australia it ends on June 30. The launches were listed as either WR or ER (Western or Eastern Range) and the only indication of LEO launches for the NRO launches was in the notes on the right hand side. Still, it might prove helpful to someone. I think the US financial year starts on 1 October. Very interesting. So if "ridesharing" is worked out with the primary customer, the secondary customer would pay the primary customer some agreed-upon portion of the launch cost? And they would have to agree upon the hardware, and coordinate CGs and EMC and so on, amongst themselves (ie not coordinated by ULA at all)? I would think ridesharing with NRO would be a tough proposition, but maybe that aft adapter would help. Does "Performance Limited" mean "I put this mission on the slide but there's no way you're going to get on it"? Sounds like either the satellite is overweight, or the US tank will get filled to as much weight as is available. Is it ever possible to bump from an Atlas 401 to a 411 or 421 after the purchase, or is that set in stone years in advance? It seems like such an innocent change. Are GeoEye and WorldView satellites both still on the manifest, or does this predate the merger? Does the >4000 margin on a 401 mean these satellites are Delta II sized? And (struggling to come back on topic...) are names like "Improved Trumpet" a description of an NRO satellite bus (like Boeing 601 or 702), or a specific spacecraft/mission (like TDRS)? Is the NRO salivating at the possibility of a Falcon Heavy-sized launch opportunity, or have they sworn off such largesse? 1. Very interesting. So if "ridesharing" is worked out with the primary customer, the secondary customer would pay the primary customer some agreed-upon portion of the launch cost? And they would have to agree upon the hardware, and coordinate CGs and EMC and so on, amongst themselves (ie not coordinated by ULA at all)? 2. Does "Performance Limited" mean "I put this mission on the slide but there's no way you're going to get on it"? Sounds like either the satellite is overweight, or the US tank will get filled to as much weight as is available. 3. Is it ever possible to bump from an Atlas 401 to a 411 or 421 after the purchase, or is that set in stone years in advance? It seems like such an innocent change. 4. Are GeoEye and WorldView satellites both still on the manifest, or does this predate the merger? Does the >4000 margin on a 401 mean these satellites are Delta II sized? 5. And (struggling to come back on topic...) are names like "Improved Trumpet" a description of an NRO satellite bus (like Boeing 601 or 702), or a specific spacecraft/mission (like TDRS)? 6. Is the NRO salivating at the possibility of a Falcon Heavy-sized launch opportunity, or have they sworn off such largesse? 1. Not always. They usually pay for integration costs. ULA is intimately involved. 2. It means the primary payload uses all the capability of the LV. Upperstages are always fully loaded. There isn't such thing as a partial propellant load. 3. Yes, but no one wants to pay for it. It does for the federal government. I think Jim was referring to Centaur/US rockets specifically. Indeed there was a Proton launch which failed due to the upper stage being overfuelled - as I recall in that case it was being launched part-empty so that the rocket would be orbital by stage 3 sep; however as it was too heavy to achieve this parking orbit it reentered before stage 4 ignition. Not sure, but I think underfuelling the upper stage so the third stage can make orbit was standard practise on Proton/Blok-D(M) launches. NROL-37 - - Mentor? - 2016 - Delta IV-H - CCAFS? NROL-67 - - NGEO?? - 2014/15 - Atlas V 541 - VAFB?? Seems the contracts for NROL-25, L-39, L-41 and L-45 were all issued together for launch between FY04 and FY07. Interesting to note since L-25 and L-41 turned out to be the same type of satellite - and it was already a good bet that L-39 and L-45 were the same as well from the configuration of their rockets. If TOPAZ is, as we suspect, a five-satellite programme, this begs the question why have only four launches been contracted? 1) Our identification of TOPAZ is wrong. Unlikely - The document which named TOPAZ and made reference to five satellites clearly stated that it was a LEO radar imaging satellite, and the older-generation satellites were referred to by a different name, ONYX, earlier in the document. 2) NROL-21 was TOPAZ 1. It is generally assumed (and may even have been acknowledged) that L-21 was a prototype radar bird. TOPAZ 2-5 are the larger operational satellites. The problem with this is that the document mentioned "TOPAZ 1-5" as being funded, and NROL-21 wouldn't still be funded since it failed in 2006. Not impossible though, and a four-satellite TOPAZ constellation would support this theory. 3) TOPAZ-5 wasn't part of the original contract, either because it was added later or simply too far away to contract for. The former is more likely - the programme is clearly behind schedule: NROL-45 was supposed to have launched in FY07. The fifth satellite could have been added to make up for ageing legacy satellites, or maybe similar delays with the follow-on satellites. I was gonna ask if you included USA-193, but that was NROL-21... I wonder if you are missing 2 and not 1 bird that has not flown yet. Maybe they have not yet been assigned launch contracts, so nothing has made it into the public yet. It seems that the identification of NROL-67 may not be correct since the current launch schedule now shows it to be launched from the Cape next March (type of rocket is correct). Next generation ELINT? L-67 is something of a mystery. It was originally listed as going from Canaveral, then seemed to move to VAFB and back to CCAFS. It could be that it actually changed launch site, or that ULA listed the wrong site in the presentation which listed it as being a west coast mission. The ULA powerpoint also stated it was going to LEO. Apart from a Misty follow-up (which I would expect to require the servces of a Delta IV Heavy), or an old RADINT satellite (I seem to remember a recent discussion concluding that an Atlas V could probably carry one from a mass and volume standpoint, but with two next-generation satellites operational and a third launching in the next fortnight, I fail to see the point), the only things which would fly to LEO from Canaveral would be Intruder SIGINT birds. I strongly doubt that L-67 would be Intruder - unless several pairs of satellites were being launched together, the mass gain wouldn't make sense. So if we ignore the LEO line, it leaves several possiblities. Orion could be a good bet, although I have L-37 as a strong candidate for a current-generation Orion so I'm not sure if they're up for replacement yet. That said L-37's launch site hasn't been confirmed yet and much of my assessment of it was based on the assumption there were no more KH-11s to launch, while the documents leaked in August suggest production is continuing. HEO SIGINT is also possible - L-67 could be a replacement for the Trumpet series. That would again be quite a significant increase in mass over the current-generation satellites however. I'm reluctant to rule out a replacement for the Quasar communications satellites - although these typically use smaller rockets commercial comsats are one type of spacecraft which are still increasing in mass rather than decreasing, and it is possible that a fourth-generation SDS could be adding new capabilities in a similar manner. It is unlikely though. And now for a completly wild guess. Most of the names listed in the leaked NRO documents have been associated with real satellites. The one exception is NEMESIS 2, which is listed as a HEO/GEO SIGINT satellite heavily funded in FY2011 but with nothing listed afterwards. NEMESIS 2 and NROL-67 (and possibly AFSPC-2 as well) could possibly be the same satellite. What that is is anybody's guess - maybe a Prowler followup? But that is pure speculation. QUASAR has to be ruled out. Delta IV heavy is around 15klb in GSO. QUASAR is less than 5klb. AFSPC are not NRO birds. Apologies, I don't want to start a new thread for a simple question, does anyone know the tail number of the NROL-67 Atlas launch vehicle? Sorry, I meant L-67 not L-37. NROL-37 - - Orion?? - 2016 - Delta IV-H - CCAFS? Somebody bumped this thread earlier asking for an update, which was probably overdue. ** - Possibly a prototype Topaz? USA 252 was launched 22.05.2014 ! "I'll be sitting in a crater on Mars looking at the stars"